Xanax is one of the most widely prescribed brand-name anti-anxiety medications in the United States. As a drug in the family of benzodiazepine medications, Xanax is a medium-acting drug with a half-life of 11.2 hours, which takes effect in the brain within one hour. Under both its brand name and its generic form, alprazolam, this medication is approved by the Food and Drug Administration (FDA) to treat anxiety and panic disorders, anxiety associated with depression, and insomnia. It is sometimes used off-label to treat depression, and it is not approved as an anti-seizure medication, although some other benzodiazepines can be applied for this condition. Warnings on Xanax prescriptions include a note not to mix the drug with central nervous system (CNS) depressants, especially opioid medications and alcohol. 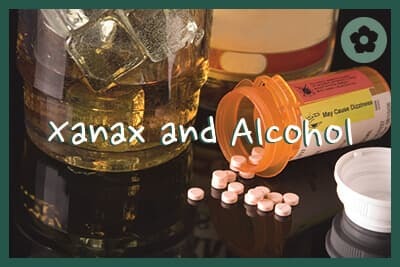 People who have a history of alcohol abuse or alcohol use disorder (AUD, formerly called alcoholism) should speak with their doctor before taking Xanax, as this medication can lead to a similar relaxed euphoria and may become addictive. Combining the two medications increases sedative effects, especially drowsiness, confusion, loss of balance, and respiratory depression. Alcohol is the most widely available and abused intoxicating substance in the US. It is legal for anyone ages 21 and older to purchase and drink, but it is abused by thousands of underage drinkers every year. Binge drinking, heavy drinking, and AUD are all forms of excessive drinking that can lead to serious problems and death. For many in the US, alcohol abuse is so common in their lives that they do not think twice about mixing prescription drugs and alcohol. This increases the risk of addiction to one or both substances, and it is called polydrug abuse. Polydrug abuse is an extremely dangerous practice. With CNS depressants like Xanax and alcohol, someone might mix these substances because they enhance each other’s effects. If a person has developed a high tolerance to alcohol, for example, taking Xanax while drinking can increase the feeling of being drunk. Some people mix their prescriptions with alcohol because they do not think it is dangerous, even with the warning labels stating that these substances can be harmful. Alcohol abuse can also increase the effects of mood disorders like depression and anxiety, so someone who drinks too much may seek psychiatric care for their mental health and combine their prescription with their substance of abuse. Mixing alcohol with Xanax increases the risk of overdose. It also increases the risk of blackouts or memory loss. These drugs compound each other’s effects because they both act similarly and they work on the same area of the brain: the gamma-aminobutyric acid (GABA) receptors. Both benzodiazepines, including Xanax, and alcohol inhibit the absorption of the GABA neurotransmitter. GABA is one of the most important neurotransmitters because it manages how fast neurons communicate with each other. When the GABA receptors rapidly absorb the neurotransmitter, there is not enough left in the brain to manage communication, so neurons fire quickly; this can cause anxiety, insomnia, and even seizures. With enough GABA available to neurons, the brain slows down communication, which relieves the feeling of stress or tension and can reduce the risk of seizures. Allowing more GABA to be available in the brain also triggers the reward system in the brain, releasing other neurotransmitters, especially dopamine and serotonin, which are associated with elevated mood and greater physical energy. Any drug that rapidly triggers the brain’s reward system can become addictive, and benzodiazepines and alcohol both cause this problem. Alcohol creates this effect indirectly. When a person drinks a glass of wine or beer, the body processes the chemical; when it reaches the brain, it acts like the GABA neurotransmitter, binding to the same receptors so the neurotransmitter itself is widely available to inhibit communication between neurons. Too much alcohol and responses will slow down; the person will become sleepy, and brain functions like breathing or creating memories will become more difficult. Benzodiazepines like Xanax can cause similar effects, although their effect on the brain is intentionally more direct. As prescription medications, they are used “as needed” for two weeks or less. They must act fast to stop a panic attack or cause the body to relax enough that the person does not feel stressed. However, because Xanax and related drugs trigger the brain’s reward center, new research suggests they can be as addictive as opiate drugs, cannabinoids, and GHB. The National Institute on Drug Abuse (NIDA) is clear that the brain’s reward system surges all the time – when a person eats something delicious, sees a beautiful image, or exercises, for instance. Unfortunately, drugs that trigger long-lasting releases of dopamine and serotonin tend to be addictive, and this group includes alcohol and Xanax. When these drugs are combined, they are more addictive, and the side effects are more dangerous and intense. The combination can be deadly. 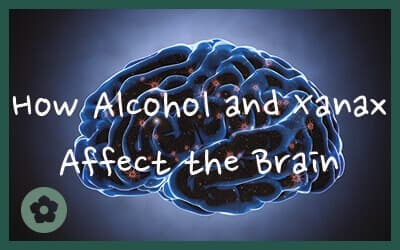 Not only can mixing Xanax and alcohol enhance the sedative effects of each substance, but their combined physical and mental side effects can be very harmful. The symptoms of intoxication get worse if the person overdoses on Xanax and alcohol. If someone displays these extreme symptoms, call 911 immediately. They need emergency medical attention. Someone who abuses either Xanax or alcohol is at risk of life-threatening withdrawal symptoms if they attempt to quit on their own. When the substances are abused in combination, withdrawal can be much riskier. Overcoming polydrug abuse involving Xanax and alcohol requires professional medical attention. Contact an addiction specialist to get help safely detoxing from these drugs and then enter a rehabilitation program that provides evidence-based therapy to overcome addiction.